Playing with Papercrafting: What To Do When You Don't Own Any Team Jerseys or Hockey Sticks! What To Do When You Don't Own Any Team Jerseys or Hockey Sticks! Many places in the world have heard about the tragic bus/semi crash that left 16 members of a Saskatchewan, Canada Junior Hockey Team dead and another 13 injured, some critically! It was a horrendous tragedy that touched the hearts of many, and especially here in Canada, where almost everybody knows someone who plays or has children who play minor hockey. In Canada, that means many bus trips to play opposing teams and the distances can be quite long, given the vastness of our country compared to the population. So, this was every parent's worst nightmare playing out for the world to see. The GoFundMe page for the Humbolt Broncos Hockey team survivors and parents has raised over 10 million now and broken a record. Yesterday, all over Canada, it was Wear a Jersey Day in honour of victims of the tragedy and people all over the country are putting hockey sticks outside their front doors for the same reason. But what do you do if you don't happen to own either a team jersey or a hockey stick, yet you want to do something to honour the victims? 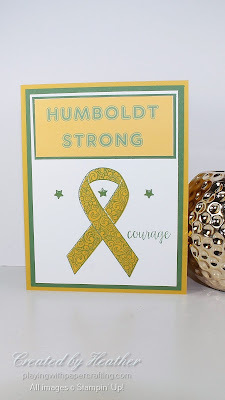 Well, if you are a papercrafter, you make a card, and that is what I did, taking advantage of the Ribbon of Courage stamp set from the 2017/18 Annual Catalogue, which I've had for a while, but haven't had the opportunity to ink up much. Luckily, it is not retiring, so I will have more time to use it, but the bundle with the corresponding framelits, where you can save 10% if you buy them both, will be retiring. So if you want this set and it's matching framelits, you should get them now and save 10%. It's a pretty simple design, and the top banner is computer generated, obviously. I made it using our retired Digital Platform, My Digital Studio, which I still find quite handy for things like this. The card is designed in the Humboldt Broncos' team colours: yellow and green and after some experimentation, I found that Garden Green and Crushed Curry worked the best at matching the colours I've seen online. 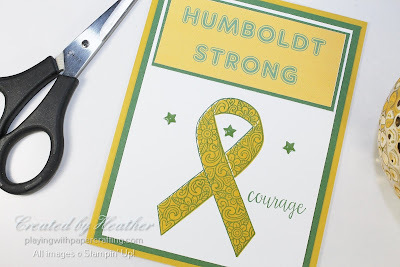 I used the Stamparatus to stamp the two step ribbon, but let me tell you, it is much more difficult to line up the second image to match the first using clear mount stamps as opposed to photopolymer stamps. It took some trial and error to get them positioned in the right place on the plates of the Stamparatus. It would have been easier if I had had the framelits that go with the stamp set, because I could have die cut a template to use for both, but for some reason, I don't have them, so it was eyeball and trial and error. I finally got them just about perfect. 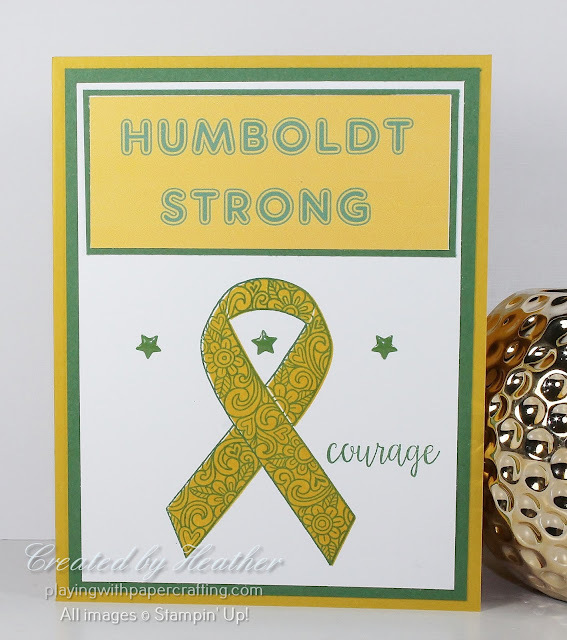 The courage sentiment is also from Ribbon of Courage and the stars are from the Regals Enamel Shapes. I will be putting in an order this evening or tomorrow morning, so this is the perfect time for you to order some of the things you want that are retiring from either the Annual or the Occasions Catalogues. 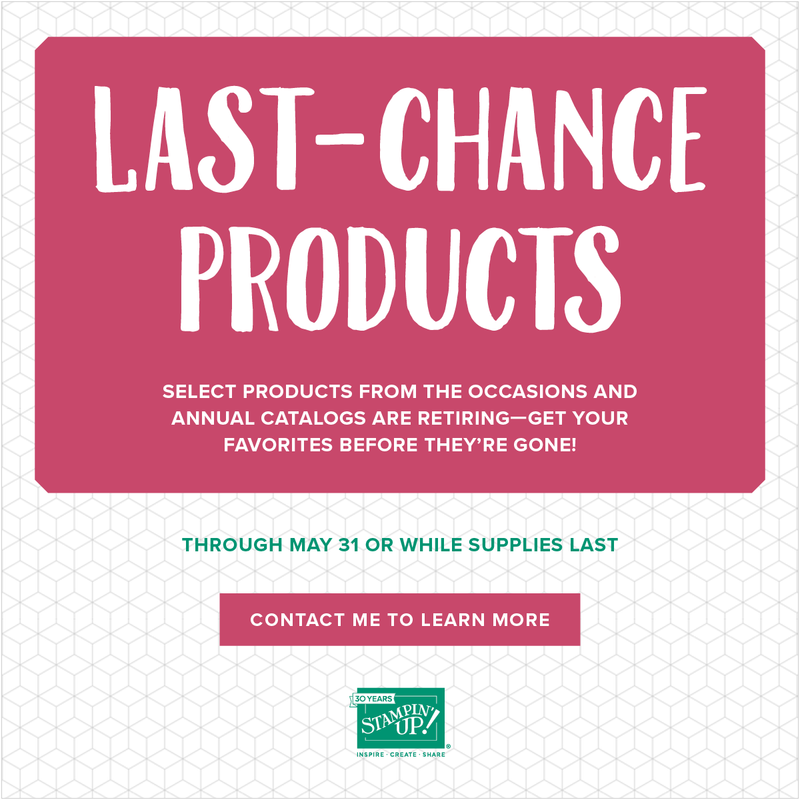 Although both catalogues are good until May 31, most products, except stamps, are only available while supplies last, so don't wait too long to order! !